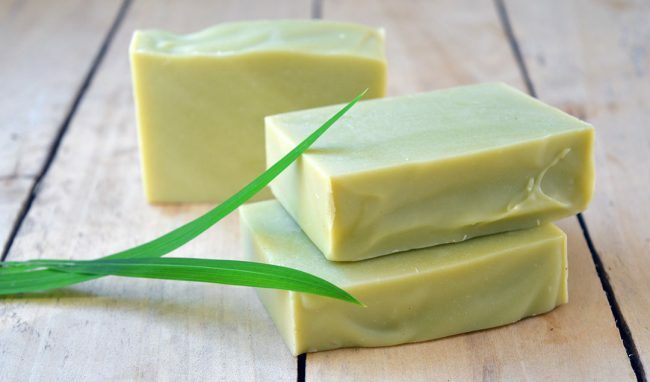 This simple recipe for handmade lemongrass soap requires only four main oils, natural pigment in the form of oxides, essential oil, and a few other ingredients and materials. It’s also a palm-free soap recipe so you can rest assured that the ingredients are as ethical as possible. Making cold-process soap is quick but there is a cure time of four weeks before you can use the bars. During that curing time, the extra water from the recipe evaporates out, creating hard and long-lasting bars. The DIY tutorial for this recipe is below along with video instructions. If you’d like to learn more about making natural soap, read through my four-part free soap making series. 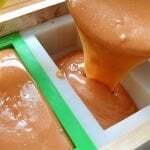 Each part includes a thorough background on soap making ingredients, equipment, safety precautions, basic recipes, and the full process of making soap. 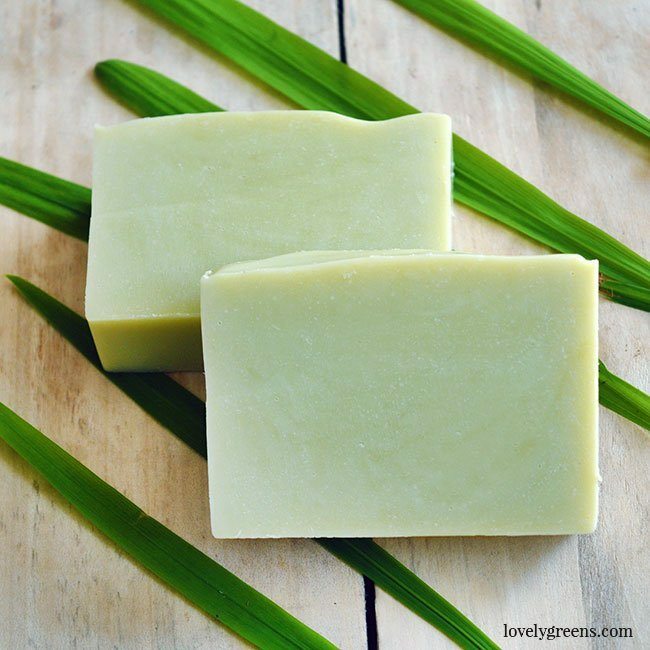 Continue below for specific instructions for the lemongrass soap recipe. It helps to be prepared so have all of your ingredients measured and your equipment and work space set up. Get your goggles on, latex/vinyl/rubber gloves on, tie your hair back, and make sure that you’ll be able to work undistracted. Also, measure all of your solid oils into the pan and your liquid oils into a jug. Pour a Tablespoon of liquid oil (olive oil) into a glass and then add in the mineral powder. Blend it with a milk frother until it’s thoroughly mixed. Set aside for now. This is the step that you need to take the most precaution. Pour the Sodium hydroxide (lye) crystals into the water in a well ventilated space. Mix together with a stainless steel spoon until the crystals are dissolved. There will be heat and steam so be prepared. The jug will get hot on the bottom and keep your face well away from the steam. You don’t want to breathe it in. When mixed, set the jug of hot lye solution in a basin of water to cool. On very low heat, melt your solid oils until there are just a few solid bits floating around. Take the pan off the heat and stir until the oils are melted. 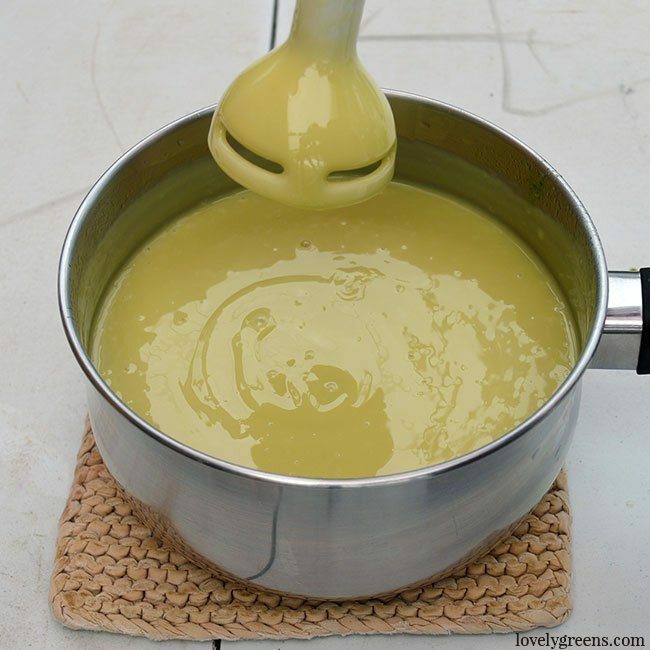 Pour the liquid oil and coloured oil through a sieve and into the melted oils. The sieve stops chunks of colour from getting into the soap. Also take care to scrape the castor oil out of the jug and into your pan. It’s very sticky so your rubber spatula comes in handy. Take the temperature of both the oils in the pan and the lye solution. The oils should be within 110-130°F and the lye solution should be within ten degrees of the oil’s temperature but lower than 130°F. When they’re just right, pour the lye solution into the pan through the sieve. Using your stick blender, alternate pulsing and stirring until you hit ‘Trace’. This is when your soap batter thickens enough that if you lift the stick blender out, the dribbles will hang around on the surface. The video above shows my method for pulsing and stirring and also what Trace looks like. Try to keep the blender’s head on the bottom of the pan to minimize air and splattering. When Trace is met, measure in the Grapefruit seed extract and essential oil. Stir well and then pour the soap into the mould. If you don’t stir well enough the essential oil will leave streaks in your soap. Not a huge deal when it comes to function but it doesn’t look great. 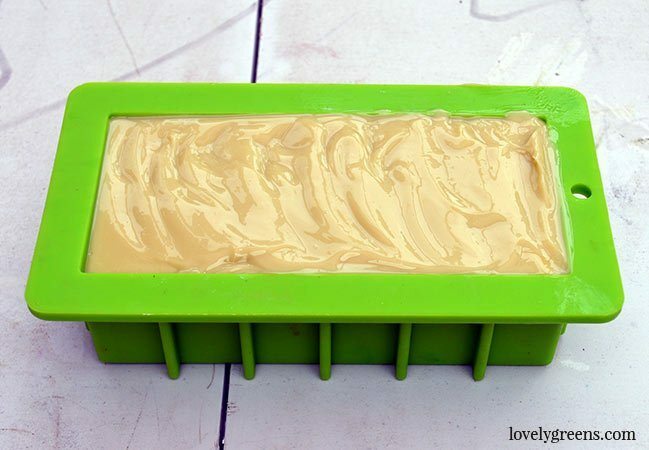 Slide your moulded soap into a cardboard box and close it up. Cover the outside with a towel to keep the heat in. Drafts will cause the soap to cool quicker causing the end colour to not be as vibrant. 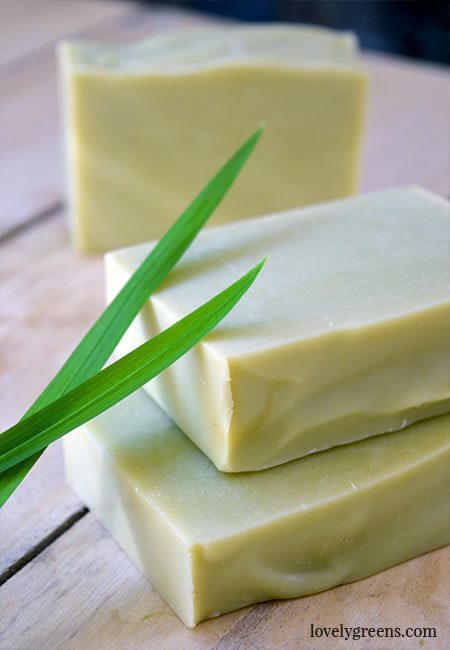 When that month is up, your handmade Lemongrass Soap is ready to be used. To preserve the scent, store your bars in a sealed tub after the curing time is up. Why is lye used and is it used in all homemade soap? Yes, all true soap is made with lye. It could be Sodium hydroxide for bar soap or Potassium hydroxide for liquid. Do you know how many grams are in a 1/16 for the mineral powders? I don’t tend to measure it in grams. It will be a tiny fraction of a gram and you’ll need a micro-scale for that. Hi Tanya! im writing from Mexico, Ican´t find the Grapefruit seed extract anywhere. Is there anything else I can use instead? Just make sure that all of your soaping oils are well within their best-by dates then you can leave it out. Grapeseed extract helps soap to not go rancid but it’s more of an issue if you’re using old oils. After reading your entire blog these past two weeks (ha) & watching your youtube videos (which are very, very helpful), I gathered all the necessary ingredients and tried out my first batch of soap this week! Ahhh brilliant! So pleased that you were able to make the recipe without a hitch 🙂 I’ve just replied to your comment on the Earl Grey Soap recipe ( https://lovelygreens.com/diy-bergamot-earl-grey-soap/ ) so I know which one you’re making next! Going to be giving this recipe a try this week but my partner is really keen to try vanilla. Could the lemongrass essential oil be swapped for vanilla scent? Yes but fragrance oil can behave differently than essential oil in soap. 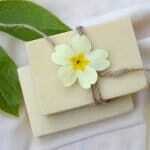 It can make it ‘Trace’ — harden up — quicker and vanilla fragrance can also tint the soap a light brown colour. The quantity will be about the same though. Make sure that your fragrance is safe for skin use and look for the manufacturer’s recommendations on what to expect as far as acceleration and usage. 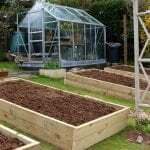 What about using green clay in place of the mineral powders? Are the mineral powders all natural? Are they simply for the color property? Thank you! Green clay is fine. Make sure to mix it with a little water before adding it to the soap though. It can cause lumps of colour otherwise. 3. How long does it take to reach ‘trace’ with the mini blender? 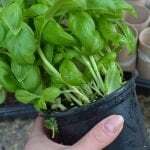 Heat proof plastic is best for the lye solution — it helps to see the level of the lye water as well as keep the contents from melting/reacting. As far as your other questions, no idea for the trace time so you’ll have to try on your own ‘mini blender’. Stick to the temperatures in the recipe and no idea on the size of the pan. Does it really matter since you already know your ingredients quantity and the volume of your own pans? The best way to clean the utensils afterwards is to keep gloves on and wipe everything down with paper towels. Dispose of the paper towels and wash your pans and utensils by hand. Just wanted to add a little bit of information that I have learned along the way working with homemade soaps. You asked about what the ideal temperature of the lye and oils to mix them together. From my experience and literature references, about 10 to 15 degrees within each other; appears to work the best. Trace timeframe question. That can depend on usage of essential oils as this can speed up trace and other reasons can simply be just the base oil you are using. Oils that have a high saturated fatty acid profile can speed trace quicker then those that are not as saturated. Since most recipes call for multiple types of oils, there really isn’t a tell sign of how quick one recipe will trace faster than another recipe. The speed of your mini blender can also affect trace time. If you are not in a hurry to use your utensils and bowls, you could let them set for a week to harden up and then wash since it will set up as soap. It is not recommended to use your utensils and/or bowls as part of food preparation once you’ve used them for soap making. Hope this information helps. Happy Soaping! Hi, I am new to soap making. I have already followed your recipe and made my 1st batch of lemongrass soap, it looked great. But I just wanna to double check with the amount of water use in your recipe. I just use a soap calculator to read your recipe and it calculated the water to be use should be 304g! The amount of water you use in soap recipes is flexible. Remember that it evaporates out of your bars completely by the end! You need at least as much water (in weight) as you have caustic soda in a recipe. I prefer using around double that amount though. 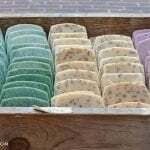 The more water you use, the slower your soap will be to harden which can be good for swirling techniques and pouring large batches. The less water you use, the quicker it will firm up — you’ll also have reduced chances of soda ash. Thank you for this recipe! I recently made it and it turned out great! Could I add activated charcoal to this soap? Can I substitute the lemongrass for another scent? And can I add dried herbs to it? Make the recipe again and double check all of your measurements and ingredients. Use the exact recipe with no additions or subtractions and always measure by weight with a kitchen scale. Another person had issues as you’ll see in the comments and it turned out they were using the wrong ingredient. Crumbly soap can sometimes be caused by using too much lye. Double check that. Lastly, it could be your soaping temperature. If the oils and lye-water are below 100F then the chances of it turning out crumbly are much higher. Good luck and I hope you figure out what the issue was. I tried your recipe with my 12 year old daughter to spend some quality father/daughter time. Very methodical and the outcome was with no flaws at all. Great explanation ! However, as this was our first time with this project I noticed that the shea butter leaves a stronger scent after the cold process than the lemongrass itself. Is this normal ? We have three more weeks of curing. Will this prevalent she butter scent lessen over time ? Or, it is the brand of shea butter I am using ? Hi Normand and thanks for sharing your experience! Pleased the steps were clear and you made the recipe successfully. As for the shea butter scent — I suspect that you’ve used unrefined shea butter. The more common shea is refined and doesn’t have that much of a scent. If you’d prefer more of the lemongrass scent in the future, try to find refined shea. Thank you ! Will try that next. That is a good pointer. 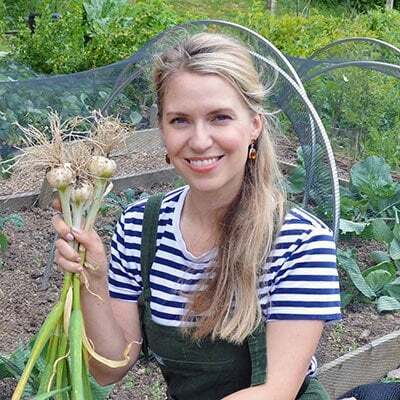 Hi I was wondering if I could use turmeric for colour instead of the oxides? Yes you could but Tumeric can add a gritty texture to your soap. Use it sparingly. Can I use liquid coconut oil? Do you mean frationated coconut oil? If so, yes you can but the lye amount will need to be updated. Fractionated coconut oil has a different saponification value from the solid oil. What does the lye add to the soap? Can you make this receip without the lye? You need lye to make cold-process soap — without it you just have oils. 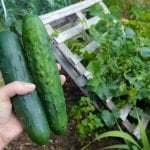 What is the superfat of this recipe? And does it lather well? Thanks! do you have a substitute for grapefruit seed extract? A lot of soap makers are beginning to omit using an antioxidant at all these days. You could do the same if you wish. I attempted this soap and came up with some pretty weird results. I measured everything precisely, and followed the temperature suggestions, but I ended up with a jelly-like substance that absolutely won’t harden up. It’s like a mix between mashed potatoes and olive oil, a big gloppy jelly. Any idea what I may have done wrong? Or if I can do anything to fix it? Thank you for your time! Any suggestions would be much appreciated. Yes, Potassium hydroxide is also a soaping ingredient — but for making liquid soap and in a completely different process. Good luck with your second attempt! I don’t have the mineral powders but I really want to make this soap. Can they simply be omitted? Most definitely. The soap will be a more creamy colour but everything else would be the same.